There’s a new addition to the 2014 Fiesta’s trim level family with an ST model that has a more powerful engine and sportier handling. There’s also a new engine option for all other Fiestas with a turbocharged three-cylinder. The exterior has been updated a bit, more features have become standard, and My Ford Touch interface is now available. 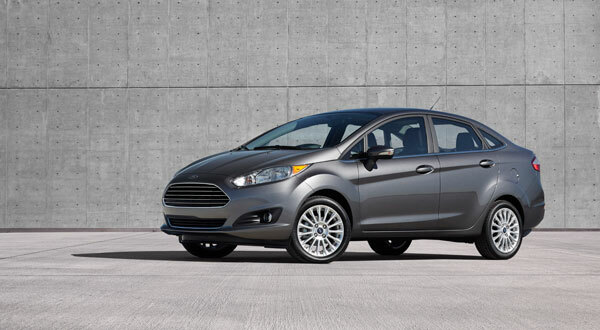 With a new, more sculpted look that includes a rounded nose and headlights that are slightly reminiscent of cat eyes, the 2014 Ford Fiesta has a distinct look that would catch anyone’s attention. The entire body seems to always be in motion, with sleek lines from front to back guiding the eye to take in all of the Fiesta’s curves. It’s the prime vehicle to personalize with the options of a sedan or hatchback and 10 different colors to choose from, including Green Envy and Molten Orange. The 2014 Fiesta puts the “fiest” in feisty with three different engine options, each making the subcompact a joy to drive. A 1.6-liter four cylinder engine that produces 120 hp is the base engine for the car, while a brand new available turbocharged 1.0-liter three cylinder adds a few more hp at 123 and a significant increase in fuel efficiency. Finally, if you’re looking for a whole lot of pep from your tiny car, the Fiesta ST’s turbocharged 1.6-liter four-cylinder churns out 197 ponies, making the car spring from zero to 60 in a matter of 7.1 seconds. For the base 1.6-liter four-cylinder engine, the EPA estimate is 33 mpg combined, while the new turbocharged three-cylinder is projected to get 40 mpg highway. The turbocharged 1.6-liter comes in with a bit less fuel economy at 29 mpg combined. Edgy is the word of the year for the 2014 Fiesta’s interior, which features a soft-touch dash top and metallic accents throughout. Some of the materials have been updated as well, creating a very premium feel within the cabin, which is completely unexpected in the economy car. The new available MyFord Touch interface and 6.5-inch touchscreen keep everyone connected, while also providing more technology than ever before with the standard Sync system, giving the driver voice control over the audio system and any phone that might be connected to it. When it comes to keeping passengers safe, the 2014 Fiesta received four out of five stars in government crash testing for overall protection, while the Insurance Institute for Highway Safety awarded the Fiesta their highest possible rating of “Good” in the moderate-overlap frontal-offset, side-impact, and roof-strength tests.